Aggressive medical interventions for acute illness may not only be of limited value but may be an overall detriment. Population aging is a worldwide phenomenon. By 2030, the US population aged 65 and older is expected to double to 71 million and comprise approximately 20% of the total population. Life expectancy, which increased to 77.7 years in 2005, is expected to increase to 79.5 years by 2020. This will correlate with an increased prevalence of chronic diseases and disability with associated enormous projected expenses. It is estimated that aggregate payments for healthcare, long term care, and hospice for patients with dementia alone will increase from $183 billion in 2011 to $1.1 trillion in 2050 (in 2011 dollars).1 Medicare and Medicaid now cover about 70% of the costs of dementia-related healthcare. Aggressive treatment of dementia patients may not always be the most judicious course of action. Artificial nutrition and hydration, for example, often achieved through percutaneous endoscopic gastrostomy placement in dementia patients, is unlikely to improve quality of life or functional status. Likewise, hospitalizing a late-stage dementia patient for pneumonia can contribute to deterioration when compared with managing the patient in his accustomed environment. In such cases, abandoning unnecessary investigations and embracing comfort care may offer the best option. Dementia, a life-limiting and incurable illness, is characterized by progressive deterioration of a patient’s usual cognitive abilities with a functional decline severe enough to interfere with daily life. Dementia is associated with a wide variety of underlying conditions affecting the central nervous system (CNS), including primary neurodegenerative disorders; vascular injuries; infections; hydrocephalic, drug induced, or metabolic conditions; and trauma. The most common cause of dementia in the United States is Alzheimer’s disease (AD), accounting for approximately 50% of all dementia diagnoses. It is estimated that 5.4 million Americans are currently afflicted with AD. Of these, nearly 4 million have severe dementia and 1.5 million have mild to moderate dementia. The estimated annual incidence of AD increases dramatically with age. It affects approximately 53 per 1,000 people aged 65 to 74, 170 per 1,000 aged 75 to 84, and 231 per 1,000 over the age of 85. Multi-infarct dementia or vascular dementia, either alone or as a comorbid condition with Alzheimer’s dementia, account for most of the remaining cases in this country. While other major causes of death have declined, AD-related deaths have risen. Presently, it is the sixth leading cause of death in the United States and the fifth for those aged 65 and older.1 The average length of survival for individuals aged 65 and older is between three and six years. Although the type of dementia is important to predict its clinical course and select the appropriate pharmacological therapy, the final stages and clinical manifestations are similar for all types of dementia. AD has been divided into three stages based on the Mini Mental State Examination (MMSE). A total score of 30 indicates no impairment, and scores between 26 and 30 are considered normal in the general population. Patients who score between 20 and 25 have mild cognitive impairment and usually experience some problems with activities of daily living, such as shopping, finances, medication use, and meal preparation. These individuals can usually live independently with some external support. Those who score between 10 and 20 have moderate cognitive impairment and usually cannot live independently. They generally have problems with basic activities such as grooming, dressing, and using the toilet. Scores between 0 and 9 denote severe cognitive impairment and problems with all basic activities, including eating and walking. Palliative care is ideally provided by a team of doctors, nurses, and other specialists who work together with a patient’s primary physicians and other health professionals to provide the extra support needed for many of the more complex medical and psycho-social issues associated with advanced illness. It is not restricted to patients who are dying and is optimally available early in a life-limiting disease trajectory to patients who may also benefit from life-prolonging treatments. Slow disease progression in dementia may often plateau for prolonged periods, making accurate prognostication difficult. This typical gradual downhill course is often punctuated by acute illness-associated delirium and decrements in mental and functional status. After a severe acute decline, the patient usually recovers to a new, lower level of cognitive and physical functioning. Palliative care can be incorporated into the overall care plan early in the dementia diagnosis and be maintained until death and then afterward with family and friends’ bereavement care. Patients with dementia may experience pain but not identify or complain about it. Prominent degeneration of the frontal lobes with related reductions in verbal capacity, motivation, and complex thinking can hinder a patient’s ability to report pain. Such deficits may also blunt pain behavior without altering pain perception. Pain in advanced dementia may present as agitation, social withdrawal, or mood changes. Depression is common in the early and middle stages of dementia. In end-stage dementia, patients rarely complain of depressed mood or report any target symptoms needed to guide therapy. For these reasons, antidepressant therapy is usually not considered in dementia’s terminal stages. Once again, a time-limited trial of an antidepressant for two to three months or a psychostimulant such as methylphenidate for one to two weeks is a reasonable intervention if depression is suspected in advanced dementia. Insomnia, weight loss, loss of appetite, inability to swallow, nausea, and dyspnea are common problems in dementia. In early- to mid-stage dementia, identifying and treating reversible causes of these symptoms may ameliorate them. In the late stages of dementia, minimizing unnecessary investigations and focusing on comfort care should be the priority. Physicians treating dementia patients should avoid polypharmacy and, whenever possible, reduce the use of minimal-benefit or high-risk medications. The use of cholinesterase inhibitors and memantine is less beneficial in advanced dementia. It is recommended that treatment should be continued only as long as clinical benefit persists. Severe dementia corresponds to a stage 6 or 7 on the Global Deterioration Scale and a score of less than 9 on the MMSE . Aspiration pneumonia, other infections, and eating problems are the most common cause of death for patients with advanced dementia.4 Dysphagia is a negative prognostic factor for survival. On average, patients with moderate to severe dementia (MMSE score of less than 18) survive less than four years. It is not surprising that comorbid factors, including older age, greater functional impairment, being male, cardiovascular disease, diabetes mellitus, and poor nutritional status, are associated with shorter survival in advanced dementia. Palliative care is not identical to hospice. As stated previously, it is not restricted to patients who are dying and is appropriate for patients who may be receiving life-prolonging treatments. This is especially important for nursing home residents when prognostication is difficult. Late-stage dementia accounts for about 40% of the total disease duration for the typical patient with Alzheimer’s disease. Weight loss, feeding disorders, infections, and functional decline in dementia should be used as indicators of poor prognosis.4 Unfortunately, family, providers, and healthcare regulators sometimes mistakenly confuse these inevitable problems with poor quality of care. 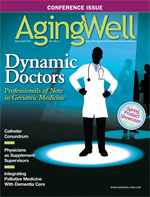 This may result in elderly residents with severe dementia receiving nonhelpful intensive medical interventions and hospital transfers during the last weeks or months of life.5 Recent studies support that quality of care and survival is better in nursing home residents receiving palliative care approaches in these situations. There are significant barriers to effective communication about end-of-life issues in the context of dementia. Unless discussions are initiated prior to or in the early stages of the disease, the loss of cognitive function can prevent the affected individuals’ preferences for their future care from being known. This, in turn, may increase the care providers’ emotional burden related to therapeutic decisions. Advance directives should be reviewed or completed as soon as possible after diagnosis. When the demented patient is not decisional and an advance directive is not available, a family member/significant other conference can be used for review and discussion of possible treatments that may be considered. This should always include discussion of the possible burden and benefit involved and not just a menu of options. A consensus should be reached, if possible. This would typically include the topics of hospital transfer from home or nursing home, treatment of infections, artificial hydration or nutrition, mechanical ventilation, and CPR. It is useful to consider what the patient would say if he or she could be involved in the discussion. There are 15 million caregivers of AD and other dementia patients.1 Fewer than 10% of older adults receive all of their care from paid workers. Unpaid caregivers are primarily immediate family members but also include other relatives and friends. Family caregivers deliver 80% of care provided at home. In 2010, they provided 17 billion hours of unpaid care, valued at more than $202 billion. Care for patients with dementia usually involves difficult decisions about treatment goals and elements of the care plan. These decisions may induce a great deal of guilt and ambivalence among the patient’s family members. Palliative medicine consultation offers support to the caregivers concerning decision making and assists in coordinating care with other healthcare providers. Hospice care is appropriate when the primary goal of care is maintaining comfort rather than maximal survival. Individuals can receive hospice care in the home, in an assisted-living residence, in a nursing home, or in an inpatient hospice unit. While it seems that patients with advanced dementia are a natural fit for hospice care, it is underutilized in this population. In 2009, only 7% to 11% of hospice-enrolled patients had a primary diagnosis of dementia. The National Hospice and Palliative Care Organization guidelines for a dementia patient to qualify for hospice services require a FAST (Functional Assessment Staging Scale) score of 7c or greater as well as difficulties with activities of daily living, including either intermittent or constant bladder or bowel incontinence. The difficulty with accurate prognostication has been a barrier to hospice referral for patients with dementia. In general, advanced dementia patients with nutritional and severe functional impairment should be considered for palliative medicine evaluation. Often patients with anorexia, weight loss, and poor functional status will meet criteria for hospice admission with the diagnosis of failure to thrive even if they are unable to enroll with a dementia diagnosis. Possible benefits for hospice and palliative medicine referral in this group of patients include delayed or possibly the prevention of institutional admission, avoidance of unnecessary diagnostics and interventions, and improved comfort. Hospice care can allow individuals to die with dignity and without pain and other distressing symptoms that often accompany terminal illness. Psychosocial support is available for patients and their families. Licensed hospice nurses can provide some additional care with the help of aides, social workers, pastoral care, volunteers, and bereavement services available. Preferentially, the primary physician will maintain his or her role in the patient’s care and maintain the role as the hospice attending. Important strides can be made in overcoming the barriers to optimal end-of-life care in dementia. Healthcare professionals caring for patients with dementia should offer a gradually changing blend of restorative, maintenance, and palliative care services as a patient’s function and the goals of care shift. Familiarity with disease terminal trajectories is essential to know when to commence palliative care. With this complicated disease, it is preferable to request specialist advice early, especially when considering potentially invasive and possibly harmful diagnostics and therapeutic interventions. — Zankhana Mehta, MD, serves as associate fellowship director of the department of palliative and supportive medicine for Geisinger Health System in Danville, Pennsylvania, and is board certified in internal medicine, geriatrics, and hospice and palliative medicine. — Neil Ellison, MD, is the department director and fellowship director of palliative and supportive medicine for Geisinger Health System and is board certified in internal medicine, medical oncology, and hospice and palliative medicine. He has a long-standing practice in hospice and palliative medicine consultation in central Pennsylvania. — Kathryn Giorgini, DO, is a fellow in the Hospice and Palliative Medicine Program at Geisinger Health System and is board certified in internal medicine. She left her private practice to complete her fellowship. — Mary Elizabeth Roth, MD, FACPE, serves as associate chief academic officer for the Family Medicine Residency Program and is director and geriatric consultant for Geisinger Northeast. As a professor for Temple University School of Medicine, she designs clinical training of medical students from three medical schools. 2. Ahronheim JC, Morrison RS, Morris J, Baskin S, Meier. Palliative care in advanced dementia: a randomized controlled trial and descriptive analysis. J Palliat Med. 2000;3(3):265-273. 3. Kovach CR, Weissman DE, Griffie J, Matson S, Muchka S. Assessment and treatment of discomfort for people with late-stage dementia. J Pain Symptom Manage. 1999;18(6):291-294. 5. Gozalo P, Teno JM, Mitchell SL, et al. End-of-life transitions among nursing home residents with cognitive issues. N Engl J Med. 2011;365(13):1212-1221. 7. McCann RM, Hall WJ, Groth-Juncker A. Comfort care for terminally ill patients. The appropriate use of nutrition and hydration. JAMA. 1994;272(16):1263-1266. 8. Zweig SC. Cardiopulmonary resuscitation and do-not-resuscitate orders in the nursing home. Arch Fam Med. 1997;6(5):424-429. 9. Dunkin JJ, Anderson-Hanley C. Dementia caregiver burden: a review of the literature and guidelines for assessment and intervention. Neurology. 1998; 51(1 Suppl 1):S53-S60. 10. Schonwetter RS, Han B, Small BJ, Martin B, Tope K, Haley WE. Predictors of six-month survival among patients with dementia: an evaluation of hospice Medicare guidelines. Am J Hosp Palliat Care. 2003;20(2):105-113. 11. Torke AM, Holtz LR, Hui S, et al. Palliative care for patients with dementia: a national survey. J Am Geriatr Soc. 2010;58(11):2114-2121.